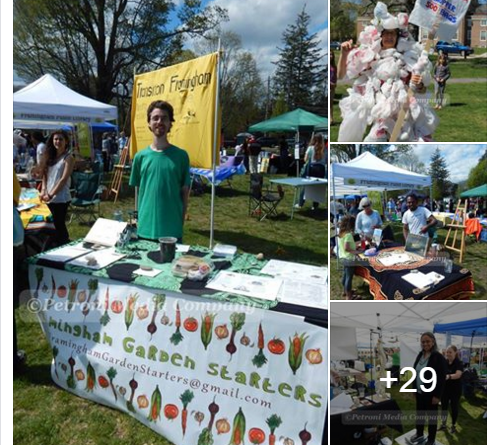 Environmentalists, families, and those looking to make Framingham a better place attended the Annual Earth Day Festival on the Framingham Centre Common on a gorgeous sunny Saturday afternoon. Started by Framingham resident Donna Merritt 6 years ago, this year’s event had the most vendors and crafters and likely the largest crowd ever. There was information on gardening and recycling. Hanson’s Farm in Framingham was selling herbs and tomato plants. Attendees could learn about how wi-fi affects their health and why Framingham should impose a plastic bag ban, like Cambridge. Framingham resident Brigitte Griffin, walked around the festival covered in 500 plastic bags to represent the average number each person brings home from stores each year. She is part of a group that wants Framingham Town Meeting members to adopt a ban on the bags. Attendees could also get a message, learn about yoga, reiki, get a henna tattoo and shop several local crafters. The Boston law firm of Breakstone, White, and Gluck as part of “Project Kid Safe” distributed 144 bicycle helmets to children, and ran out halfway through the event. Volunteers from the law firm, the Framingham Bicycle and Pedestrian Committee, and the Framingham Police Bicycle Patrol provided instruction on how to properly adjust and wear the helmets. Photos by Susan Petroni/Petroni Media Company ©2016. All Rights Reserved. High resolution photos are available for purchase. Email petronimedia@gmail.com for more information.